Our mission includes shaking the foundations of the construction industry – right to the core. And we are ready to go again! Right on the heels of the recent success of our ReThink911 Canada Tour, we are ready to build on the momentum with a three-day foray into heart of the 2014 National Convention of the American Institute of Architects. 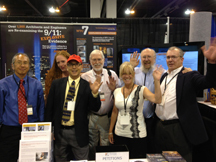 If you will do your part to send us there we will bring home 100 new A/E petition signers from the largest convention center in North America, hosting 20,000 architects! Never before have we had this kind of opportunity to sound a wake-up call to so many in the building trades who remain unaware of the real facts of 9/11. But we can't take advantage of this unique opportunity without your support. We have to raise the funds by May 26th – that’s just 30 days to raise $10,000. We will get the chance to connect with and educate hundreds of professionals in this high-profile atmosphere. It’s an opportunity you can’t let AE911Truth pass up. Please donate now. Just $10 will wake up an architect! Consider this – on our recent three-week ReThink911 Canada Tour, AE911Truth traversed across the country, presenting in 16 different cities, facing ice storms and blizzards, to get our evidence in front of four architects and 59 engineers. By contrast, the three-day event in Chicago will put us in the company of up to 20,000 building professionals – all under one roof! When we put our video screens in front of their faces, we are confident that they will choose science and truth over myths and lies. So, if you've been considering donating to AE911Truth, now is the perfect time. Please aid us in tilting the balance toward critical mass awareness of 9/11 truth. Remember, our work only happens with your financial help. And it doesn’t happen without you. Don't let the mainstream media have the last word. Also, if you know anyone in the Chicago area June 26-28, or can get there, consider helping us at the booth! But if you can't stop in, please chip in whatever you can to help us make the most of this remarkable opportunity. 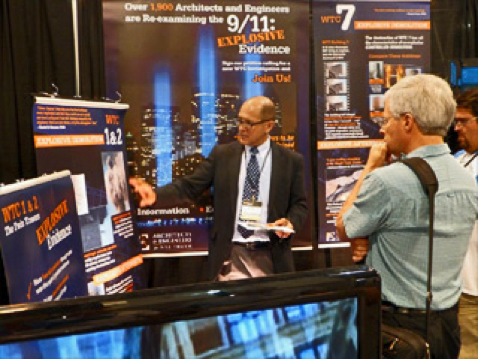 On behalf of AE911truth, we thank you once again for your generous support and commitment to the vitally important cause of 9/11 truth.